The Greeks were convinced that dance was the language of the gods. Dance was for them a means to get closer to their gods. There are read vague descriptions, but they usually come from philosophers such as Homer and Aristotle. Plato wrote: "The religious dances are not just religious acts; this mysterious dances depict the character of the gods to whom they are dedicated. " Mastering the art of dance was considered a sign of education and civilization. Images on vases and frescoes give a further idea of what was possible danced. Around 550 BC the Greeks ruled southern Spain. In Greek art are also dancers with arm feature and postures similar to that of Spanish dancers of today. They also show castanets like instruments and hand clapping to accompany the dance. 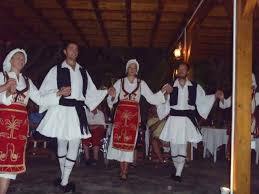 Characteristic of Greek dancing is to limit the movements of the pelvis. In Greek mythology, the dance occurs in Rea, wife of Kronos, who had dethroned his father Uranus. Because Kronos feared that his children would also expel him, he ate all his newborns. When Rea gave birth to the last child, Zeus, she wrapped a stone in swaddling clothes and gave this package to Kronos. Who ate it without suspicion. Rea hid Zeus in a cave on the island of Crete. The child was fed with honey and goat's milk. She asked Kourites to perform war dances of the cave so that Kronos would not hear the cries of the baby. When Zeus later dethroned Kronos , Kourites became the priest of the new world. His followers went on with the originated dance as part of a religious ceremony. The oldest data come from the Minoan civilization on Crete from 3000- 1400 BC. Music, singing and dancing heard together in entertainment and in religious ceremonies. Crete was occupied around 1,500 BC by Greece and much uses were included to the home contry. Dance was part of theater, both in tragedy and comedy. In a tragedy actors story the deeds of kings, from myths and legends of gods and demigods. This was interspersed with singing and dancing of the choir. Fifteen men in three rows behind each other commented on the story with songs and dramatic gestures in solemn dances. These differing dances were called emmeleia. Emmeleia also represents a performed by women in honor of the gods reverent, solemn dancing around the altar or a procession to a temple. In the comedies events in Greek politics and celebrities were taken in the sights with games, dancing and singing. Later also funny and absurd scenes from everyday life. Popular in comedy was the kordax, which was challenging shaken with abdomen and buttocks, while the feet remained standing next to each other. A typical movement was hitting its own buttocks with the heels. Contemporary writers disapproved this dance (obviously). Battle Dancings were military training in concentration, agility, speed and power. The best known is the pyrriche performed by nine armed dancers to worship the Phrygian goddess Cybele. It is a weapon dance in which guys since the age of five practiced their martial skills in both Athens and Sparta. Also popular was the Gymnopedie, a dance in which naked young men struggled with each other. Later it became more of a theater dance with an emphasis on beauty and spectacular moves. Women also brought him up as main dance of the Lacedaemonians that were celebrated annually on the market square of Sparta. The Geranos depicts the story of Theseus, who after killing the Minotaur in the Labyrinth of Knossos, stopped at Delos to sacrifice to the goddess Aphrodite and thereby danced around an altar. The Ierakio was a woman dance at festivals around the goddess Hera. The Epilinios was an ecstatic dance where the harvested grapes were crushed by foot. The satirical Sikkinis dance was danced by Satyrs who thereby imitated the movement of cats. The Imeneos was a quick wedding dance with many turns, danced by the bride with her mother and friends. In Hormos a young man leads a row of dancers with skilled movements. A young woman mimics those as an example of decency and respect for all other female dancers. Iporchima is a combination of pantomime and music, danced in Crete by boys and girls who meanwhile sang poems. From this about 300 different Balkan Dances were made. There were several annual religious festivals. The most prestigious (from the sixth century BC.) was the spring festival in honor of Dionysos. The dithyramb was an ardent hymn to Dionysos. Performed by a large group of men or boys while dancing in a circle. The dance leader portrayed in the middle with dramatic gestures of life, death and resurrection of Dionysos. Not all dances were subdued and respectful. Wild rituals were performed in honor of Dionysus, the god of wine and ecstasy. The maenads - into frenzy 'fallen women' - went singing and dancing into the mountains. These bloodthirsty savages stomped, swirled and jumped for days until they were in a trance. They were at the height of their delirium apparently even bloodthirsty and teared animals. Later did men disguised as satyrs participate in this worship, and they became orgies. Dionysus was called by the Romans Bacchus. The Greeks hadas the goddess of dance 'Terpsichore' who was also muse of dance with the Romans.